Just think; Coming home from a long day at work and your floofer is waiting for you at the door. Waking up to your pupper sprawled out at the foot of your bed. Going for walks with your wuff when you want to get out of the house but your mates are nowhere to be seen. Cuddling your fur bae at home when you don’t want to leave the house after a mighty dose of the fear. We all love our doggos, and here at Shaw Cafe we want to give those special guys some cuddles for being the bestest boys. They’re our equals and we love them dearly. They deserve a day out filled with class and bubbly. October 13th will see Pawsecco, Doggy Beer, Bottomless Treats and all your favourite pupper films for you and your cuddle baby to enjoy together in our gorge Beer Garden. 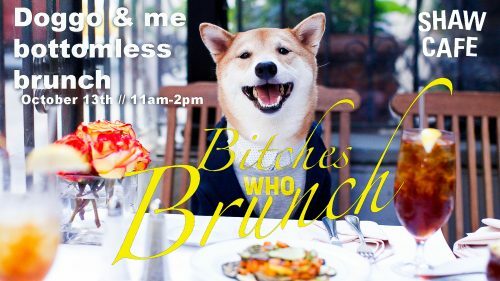 Brunch will be curated by Botequim Head Chef Pedro & Shaw Café veteran Silvana with bottomless vino / beer for all you PupperLuvr’s. Of course we’ll also have the Doggie Beer, Pawsecco and treats on Bottomless too. In the meantime you can check more of Shaw Cafe here.